Halloween lovers look forward to October, when their favorite haunted attractions rise from the dead, so to speak, and open their (albeit creaky) doors for business. Operators look for new and creative ways to give their visitors the scary thrills they’re looking for in the main attraction, and once their collective heart rates return to normal, are happy to oblige their need for food, drink, and a little something to take home with them. 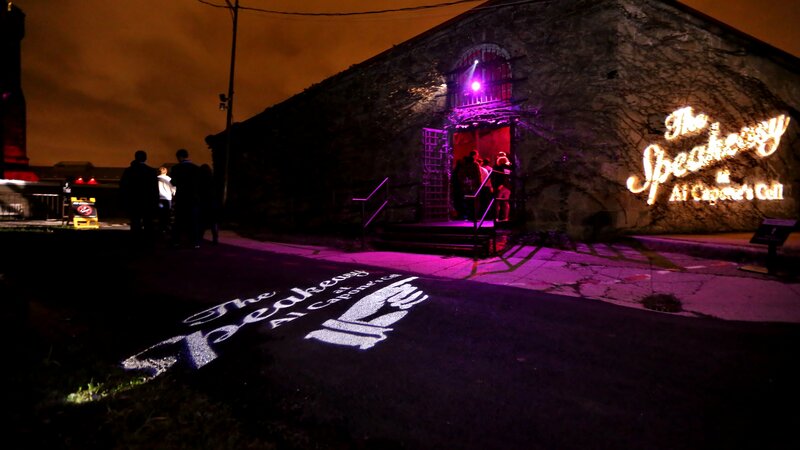 The Speakeasy at Al Capone’s Cell at Terror Behind the Walls at Eastern State Penitentiary. The attraction offers themed cocktails and a tour of the cell. 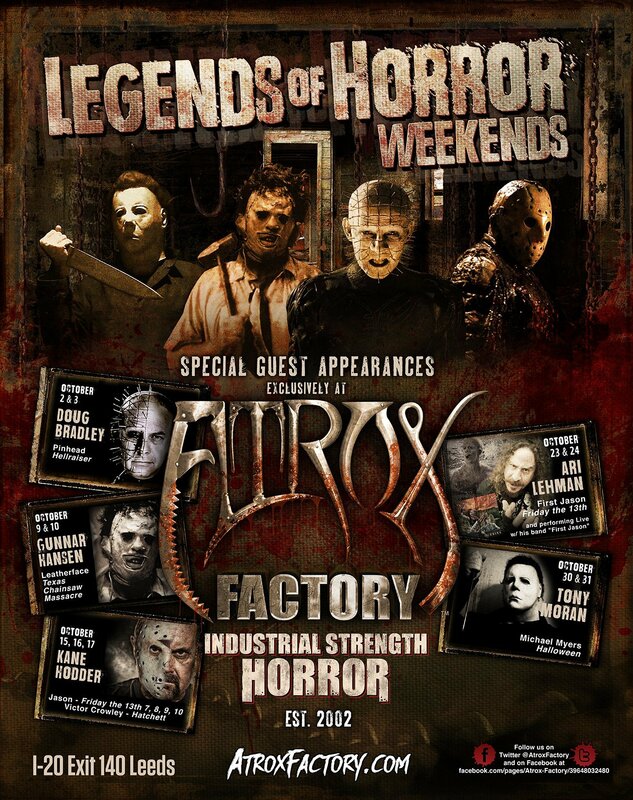 A promotional item from Atrox Factory in Leeds, Ala., for the Legends of Horror weekends. Every weekend in October, the attraction brings in a new celebrity horror guest. The haunt additionally offers a variety of food items. The Eastern State Penitentiary itself is an historic landmark where Al Capone was once a prisoner (visitors can tour his cell and enjoy themed cocktails at Al Capone’s Speakeasy on the grounds). The prison’s colorful history and imposing physical structure not only makes for a thrilling haunted attraction but provides several opportunities for unique food and merchandise, and Bertolino said he and his team are constantly looking at new ways to enhance both categories. Food trucks are a natural tie-in with the haunted attraction and park venues—as mobile units they can go to the customer, rather than make the customer go to the food as they must do for a static concession area. It helps that they’ve seen a huge boost in popularity over the past few years, so ordering from a food truck is still trendy. Operators said using both static and mobile concession methods increase the visibility of their food offerings and simply makes it more convenient for visitors to get something to eat. Angela Moyer, owner and “Scream Queen” of Waldorf Estate of Fear in Lehighton, Pa., said she solely uses food trucks for her concessions. “We sell chicken fingers, fries, funnel cakes, deep-fried food, and drinks,” she explained. Unlike food, which fulfills a more immediate need, merchandise is another way visitors can extend their experience and take a piece of it home with them. Johnson said it’s hard to gauge what will sell, so his philosophy is to stock a range of items. Their Emporium is the central location for merchandise. “We sell T-shirts and hats, and a lot of jewelry,” he explained. “We never know what people will want. For every item that sells, someone else sees the same item and will say ‘Who would want that?’ We do try to get the guests to spend.” As an added draw, Johnson schedules actors from horror film and TV shows for celebrity appearances on the weekends during their peak season. 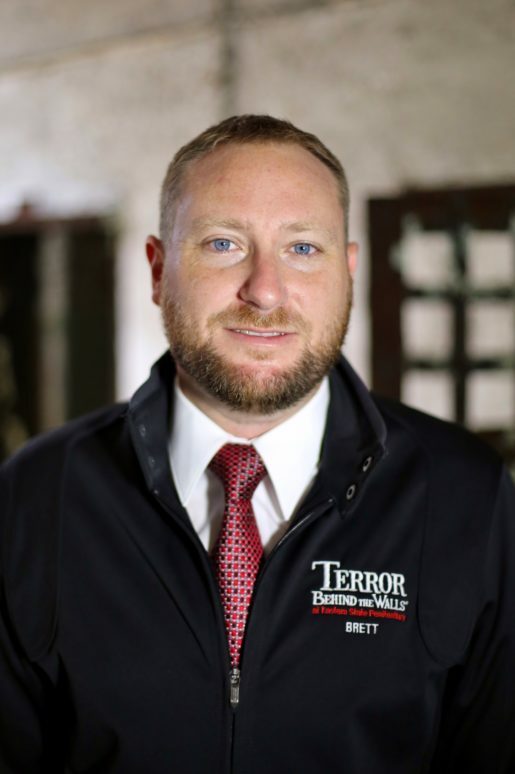 Brett Bertolino, vice president, director of operations, Terror Behind the Walls at Eastern State Penitentiary in Philadelphia, Pa. The attraction offers a consistent menu, as guests like the familiar in food, he said. Haunted attractions may only be running for a few weekends a year, but devoted fans try to extend the experience for as long as they can—all year long if possible. Operators are tasked with satisfying both casual and hard-core thrill seekers. Unique food and merchandise help to round out that experience.